Diana Anhalt, Second Skin, FutureCycle Press, 2012, 30 pages, ISBN-10: 193885313X, ISBN-13: 978-1938853135, $9.95. 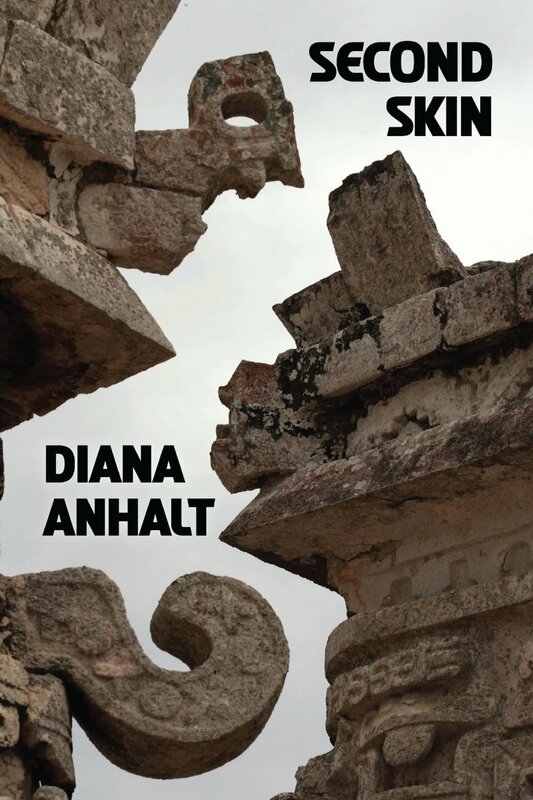 People who claim to hate poetry should read Diana Anhalt’s Second Skin, her loving bouquet to Mexico, where she lived for sixty years before moving back to the United States in 2010. Funny, irreverent, touching and easily accessible, this wonderful collection from a woman who never lost her Bronx accent invites, cajoles, embraces and seduces. Here the resplendent syllables of Spanish and Nahuatl flavor the poems like herbal seasonings, and the wacky, non-rational faces of Mexican culture adorn them like tendrils of bougainvillea. This is a New Yorker talking, but a New Yorker tempered by lifelong exposure to Mexico’s rhythms, customs and warmth. The language by turns rushes and relaxes, and always at the heart of the poems one finds a passionate, generous spirit. You will look in vain here for obscure symbolism or Robert Bly’s damning indictment of “chill, competent workshop poems” with which he tarred a lot of what he had seen in contemporary poetry. Competent these poems are, certainly, but there isn’t a chill note to be found. The richest of them—“Mexico,” “Student Driver,” “To My Mover,” “Ode to Spanish,” “Nostalgia’s Map”—are among the most engaging and memorable poems I can remember. flashing a finger, and dancing a zapateo down my spine. and a tongue to fold around words like Huitzilopochtli. an African family tree carved from ebony. behind the volcanoes—they’re not on this invoice. and carrots. What about the church bells, the mariachis? the colors—fuchsia, scarlet, raucous chartreuse? Damn it! Why don’t you listen? I’m just getting started. What the hell have you done with my friends? break promises, or step on pavement cracks. I wouldn’t, in my lisping toothlessness, pronounce. turned me wordy, oblique, insincere. too big for my child-sized mouth. XEQK grounded my Mexican minutes, grounded me. out a music I couldn’t dance to, had yet to fathom. minute after minute—La hora exacta. The exact time. Glostora para el pelo, Funeraria Gayosso, Victoria beer. Veinte millones de Mexicanos no se pueden equivocar. Twenty million Mexicans can’t be wrong. beneath my tongue for when I crash the car, break my leg. as a horse trots by. is impossible. But it’s who you are, not where you are. on the shoulders of my former self, I take a deep breath. Prepare to plunge into tomorrow, a foreign territory. Study its maps. Drive down Peachtree. For anyone who knows Mexico, especially Mexico City, these poems will fit like an old familiar jacket. And for those who don’t, they are opening doors of welcome impossible not to step through. Peter Ludwin is the recipient of a Literary Fellowship from Artist Trust and the W.D. Snodgrass Award for Endeavor and Excellence in Poetry. He was the 2007-2008 Second Prize Winner of the Anna Davidson Rosenberg Awards. For the past twelve years he has been a participant in the San Miguel Poetry Week in Mexico, where he has studied under such noted poets as Mark Doty, Tony Hoagland, Joseph Stroud and Robert Wrigley. His work has appeared in many journals, including The Bitter Oleander, The Comstock Review, Nimrod, North American Review and Prairie Schooner. His first book, A Guest in All Your Houses, was published in 2009 by Word Walker Press. His second, Rumors of Fallible Gods, was a Finalist for the Gival Press Poetry Award in both 2010 and 2011, and has been published by Presa Press. He has been nominated multiple times for a Pushcart Prize. Soundings Review named him the winner of its spring/summer 2011 Reader’s Choice award for his poem, “A Convocation of Crows.” The Comstock Review designated his poem, “Trial of Compassion, Baker City, Oregon” a Special Merit Recognition recipient in the 2012 Muriel Craft Bailey Memorial Awards Contest. An avid traveler who has visited remote Indian families in the Ecuadorean Amazon, hiked in the Peruvian Andes, hitchhiked in Greece and bargained in the Marrakech market, he spent nearly a month in 2011 in China and Tibet. He lives near Seattle. Diana Anhalt is a former resident of Mexico, having moved there from New York City with her family at age eight. She is the author of A Gathering of Fugitives: American Political Expatriates in Mexico 1948-1965 (Archer Books), poetry, and numerous articles, published in Mexico and the United States. Second Skin, just released by Future Cycle Press, is her second book of poetry.